Cristobal Alessandri and Pratyush Pandey in the lab. Ferroelectric materials have the potential to improve a number of characteristics of electronic devices, including memory and power efficiency. However, these materials are difficult to predict and, therefore, to effectively use. To better understand ferroelectric dynamics and variability, Notre Dame researchers have developed a simulation framework that predicts the dynamic response of a ferroelectric and enables improved assessment of the applications. Cristobal Alessandri and Pratyush Pandey, graduate students of electrical engineering at the University of Notre Dame, will present their research on ferroelectrics at the International Electron Devices Meeting (IEDM). The event is described as “the world’s pre-eminent forum for reporting technological breakthroughs in the areas of semiconductor and electronic device technology, design, manufacturing, physics, and modeling,” and aims to showcase the latest research advancements. 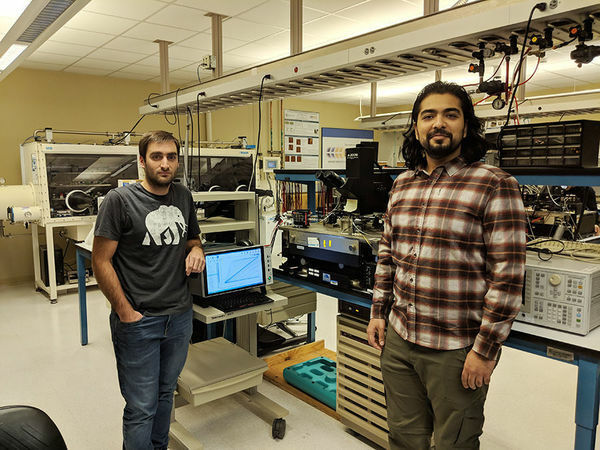 For their research, Alessandri and Pandey utilized the Notre Dame Nanofabrication Facility to develop a process for creating ferroelectric devices. Their first insights into the dynamic switching in these devices were published last month in IEEE Electron Device Letters. Then the graduate students experimentally validated a physics-based model to predict the ferroelectric’s behavior for arbitrary input waveforms. By doing so, Alessandri and Pandey are now able to make predictions regarding the variability, scaling, and memory applications of the ferroelectric material, which make up the presentation at IEDM. “With this phase of our research, we were able to extract significant parameters of the ferroelectric to create a predictive model, which gives us useful insight for a better understanding of this material system,” said Alessandri. Alessandri and Pandey, graduate students in the lab of Alan Seabaugh, Frank M. Freimann Professor of Electrical Engineering and director of NDnano, will present their latest study on Tuesday, December 4, 2018 at IEDM in San Francisco, CA. The research was conducted with the support of the Notre Dame Integrated Imaging Facility. To learn more about Alessandri and Pandey’s research from Seabaugh’s lab, please visit https://seabaugh.nd.edu/. Originally published by Brandi Klingerman at research.nd.edu on December 04, 2018.